I picked up the Samsung Galaxy Nexus yesterday on a new 3-year contract with Bell for $169.00. 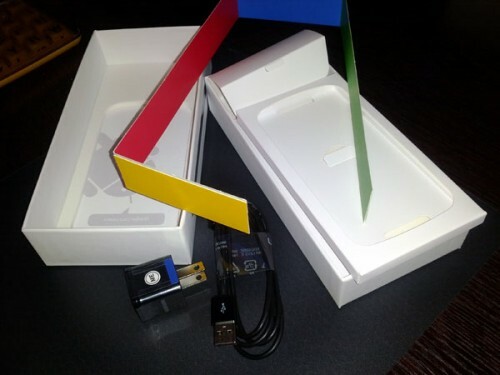 You can also find them on eBay for as low as $600 today with overnight shipping from these Galaxy Nexus Smartphone sellers. Coming from the HTC Nexus One and then the Samsung Nexus S, there are many things I love about the new Galaxy Nexus, and a few things that got me scratching my head and at times saying, “WTF?”. 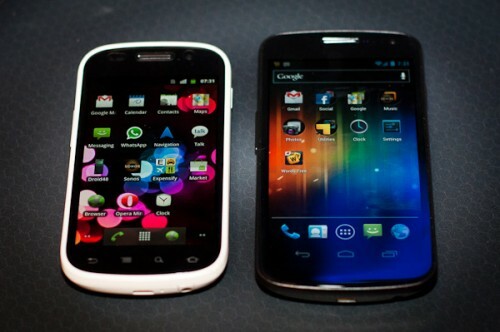 This quick review is to talk about my 18-hour experience of transitioning from the Nexus S to the Galaxy Nexus and the things I’ve discovered. These are the same things you will discover when you first pick up and use the Galaxy Nexus with Ice Cream Sandwich (ICS), the Android 4.0 operating system supplied by Google for this device. The packaging is a mess. Once you pull everything out of the box to get it up and running, you have a heap of cardboard and paper to deal with. But who cares, it’s a damn box. Into my closet it goes. Do not make me laugh out loud (aka LOL) because if you have never used a smartphone before, consider signing up for Smartphone 101 classes. 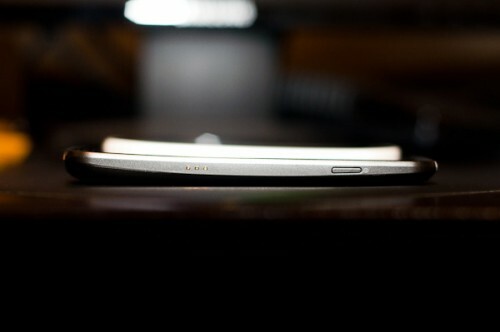 There is no user manual for the Galaxy Nexus. 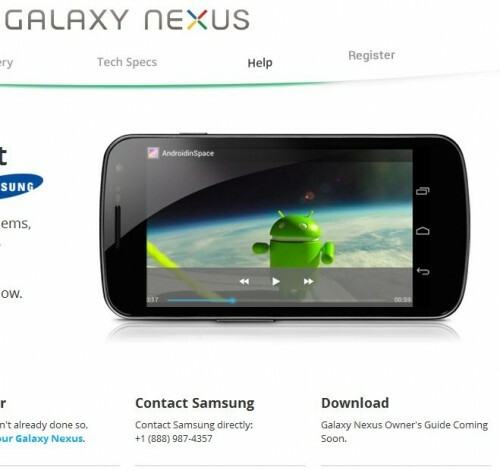 If you head over to the Google Galaxy Nexus website, you are greeted with a “Galaxy Nexus Owner’s Guide Coming Soon” text on the main page. Again, not something I’m going to cry about, but for first-time smartphone users, this is not a good introduction into the handheld computing world. Patience or a 12-year kid is needed for training. While waiting line at Best Buy, two elderly customers came in asking for help on basic functions for the Galaxy Nexus that is now second nature to most of us. They had to be thought that these phones allow you to ‘swipe’ and ‘press-hold’ certain areas of the screen for more functions. The Best Buy employee trained them for 1.5 hours on how to use the phone. This would be funny, if it wasn’t sad. It is very big and very thin. 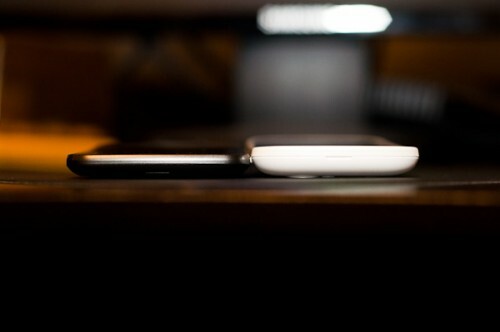 Photo of the Galaxy Nexus placed beside the old Nexus S.
Now let’s cut to the chase and showcase the UI experience from a Nexus One/S owner to a Galaxy Nexus owner. 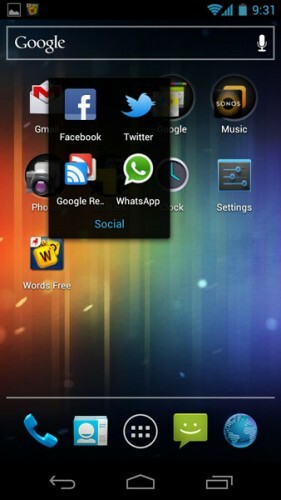 Note that you can capture screenshots on the Galaxy Nexus by pressing the Power+Volume-Down button at the same time. Finally, a screen capture feature. 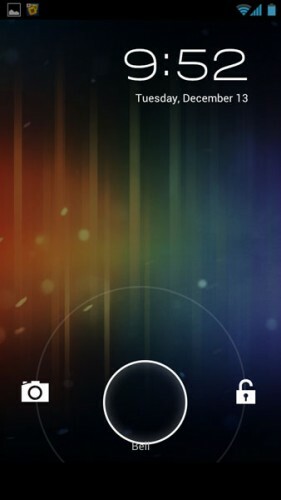 The lock screen allows you to Swipe-Left directly into the camera, or Swipe-Right to unlock the phone. For a photographer, the Swipe-Left directly into the camera is a much appreciated feature. I do miss the swipe feature to change volume to vibrate and wish Google added a Swipe-Up and Swipe-Down feature for users to customize additional swipe functions. As applications are installed, they are automatically added to the desktop. Great idea, but can be annoying for some users. The desktop now supports folders and you set it up just like the iPhone, by dragging one icon onto the other. Tap on the space below the icons to give it custom name. You can customize icons on the dock. Press-Hold an icon on the doc to get started. When pulled down, swipe on the notification row to get rid of individual notifications. This is a very nice addition and still better than the iOS design on my iPad. 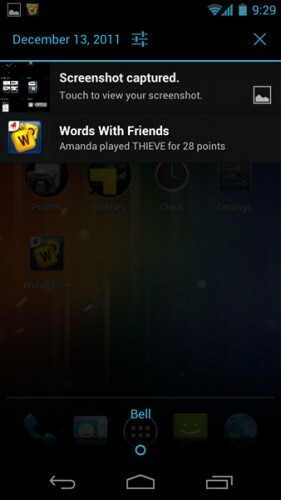 The bottom of the Galaxy Nexus features a notification light that displays when there are unread notifications. I greatly missed this feature after leaving the Nexus One and this has caused me to lose many e-mails and SMS’s that had to be sent urgently. Now I am happy again. 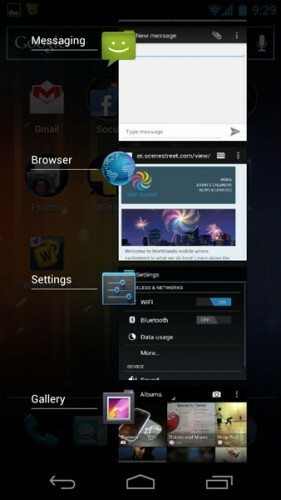 There is a dedicated multitask button on the bottom navigation row. Again, swipe on the running task to kill that task or click on it to open it. Gone is the old-fashioned way of Press-Holding on the desktop to add widgets. You can find widgets in the drawer by Swiping-Left to switch to the Widgets tab on the right side of the drawer. Now here are some oddities with Ice Cream Sandwich that has left me scratching my head. There are (count them) THREE menu buttons to replace the ONE menu button Google took away from us. Depending on the app, the menu button can appear in any one of three locations. The menu appears as three vertical dots if a menu exists. At the top of the application. At the bottom of the application. At the bottom-bottom of the application in the navigation row. Google isn’t sure whether it wants to follow Microsoft’s Metro concept or go with the more traditional vertical scroll. So it decided to use both just to be sure. 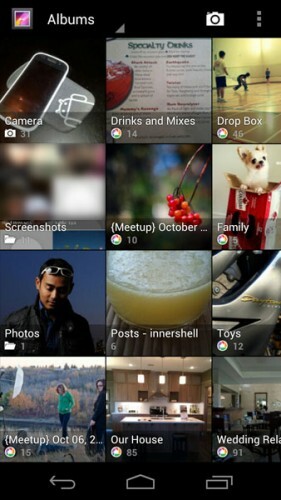 In the Images app, the tiles scroll horizontally and are cut-off in the Metro style. 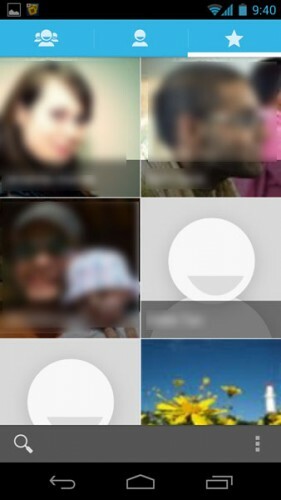 In the contacts, the tiles scroll vertically. I was unable to transfer the photos from my Nexus S to the Galaxy Nexus initially. When I copied the photos into the DCIM/Camera folder, the copy process would hang on Windows and Mac. Later, I discovered that there was a permissions problem with the folder and the fix was to delete the DCIM/Camera folder and then recreate it. After that, images transferred without issues. Pinch to rotate the screen so that I can set auto-rotate off and rotate the screen as desired. Fix for the Auto-Brightness. The screen is too dim on auto. Despite some of its trivial oversights, 98% of this phone is great and is the best smartphone I have ever owned. It is fast, it is big, and there is enough spacing between keys on the keyboard for me to type with high accuracy. I would buy this phone without hesitation. You might also wait for “3G video calls” using the regular Cellular Networks not using the Internet, the bad thing that “Galaxy S” has video call feature while ICS doesn’t !! shouldn’t you wait for this? I do not use that feature, so to me it is not that important. It might be for others though. I couldn’t do that because some of my pictures were of documents, which contained private information. I didn’t want it anywhere on Picasa.